Variants: A, B (T.2/2A, T.4/4A), E, S (GR.1/1A/1B, GR.3/3A), IS, IT, IM. Developed cooperatively by the United Kingdom and France, the Jaguar is a light but capable strike aircraft. The Jaguar is a fast aircraft for its class, having a long sleek fuselage and two afterburning turbofan engines. It is used in the reconnaissance, advanced training, close air support, maritime attack as well as in the strike and interdiction role. Jaguar A is the original prototype and the French single-seat attack version. Jaguar E is the French tandem two-seat trainer variant with dual controls. Both were equipped with Adour Mk 101 engines, although they were quickly replaced by the Adour Mk 102. The French Jaguars saw combat in Africa and the Balkans, before the last squadron (EC.01.007) retired its final examples from operational use on July 1, 2005. Jaguar S designated GR.Mk1 (GR.1) by the Royal Air Force is the British equivalent of the Jaguar A with a laser in the nose. The Jaguar B is the RAF's advanced trainer designated T.Mk2 (T.2) and has a more advanced full suite nav/attack system. Although originally delivered with the Adour Mk 102	engines, they were quickly retrofitted with the more powerful Rolls-Royce/Turbomeca Adour Mk 104 turbofans. GR.1A is an upgraded GR.1 aircraft with the nav/attack system from the T.2 and self defense systems, which were also added to the T.2A upgrade. Reconnainssance aircraft are equipped with a centre-line pod housing five cameras and an IR linescan. The GR.3 and T.4 are the last RAF standards of RAF GR.1s and T.2s respectively. The upgrade program included new cockpit displays, helmet-mounted sights, the ability to carry the new Advanced Short Range Air-to-Air Missile (ASRAAM) and other system improvements to further extend the life of the aircraft into the 21st century. Finally, in the twilight of their career with the RAF, 60 GR.3/T.4 aircraft were fitted with the Adour Mk 106 engine, a rebuild and enhanced version of the Mk 104 offering better reliability,	maintainability and slightly more thrust. All export Jaguar Internationals are based on the RAF's Jaguar B/S airframe. Export customers are Ecuador, India, Nigeria and Oman. 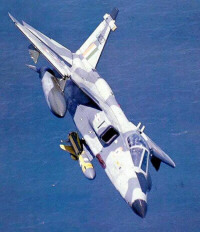 India is the biggest Jaguar operator today, with Jaguar IS strike , IT trainer and IM maritime strike aircraft. The latter have the Agave radar in a reprofiled nose and are armed with BAe Sea Eagle anti-ship missiles.